Children love to learn new things! Make learning fun with these flashcards that will help your child develop his language skills. While your child is learning his numbers and letters, he will also be introduced to language skills that deal with science, health, safety, manners, community helpers, geography, history, family, colors, shapes, numbers, and more. Provided for you is a teacher guide with detailed lesson plans. 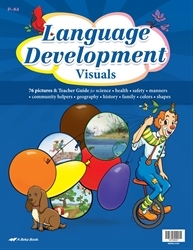 Special features include fun poems, looking and thinking activities, detailed information for you to teach, discussion topics to allow your child to talk about the subject, and exciting games! Your child will love learning about all the wonderful things around him while you enjoy seeing him increase his vocabulary skills. Preschool.